If the first summer is any indication, a lot of Jewish students at the University of Alabama will want to spend next summer in Birmingham. 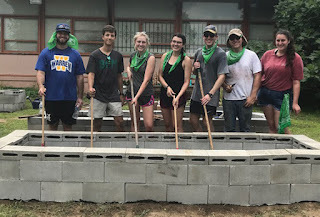 Seven students took part in the inaugural Hillel Connections program, coordinated by the Bloom Hillel at Alabama, taking summer internships in Birmingham, learning about life beyond college, making connections with the local Jewish community and experiencing the city as a whole. Two of the seven will continue working in Birmingham this year, and five have been offered employment during Winter Break or next summer. It is also seen as a way to get Jewish students at Alabama, most of whom are from outside the state, to consider staying in Alabama after graduation. The program was underwritten in part by the Birmingham Jewish Foundation and the Rabbi Milton Grafman Endowment Fund at Temple Emanu-El. At a July 27 Shabbat service at Emanu-El, the interns expressed their appreciation to those who made the experience possible. Housed in a dorm at the University of Alabama at Birmingham, they lived on the edge of the resurgent downtown area and had “a great place to watch the fireworks” on Independence Day, Jake Kaplan noted. The students also participated in projects around the general community, including helping at Oasis Gardens in Ensley. The project, started by Hank Layman, sets up raised planting beds for vegetable gardens in what is otherwise a “food desert.” The beds are built above ground because of soil contamination in the area near defunct industrial plants. “It was good to get to work with your hands for a bit,” Kaplan said. All of the participants this summer have been active in Hillel, where they first learned about the program. Eric Weintraub said “the seven of us have bonded, worked together and accomplished some great things.” An accounting major, he spent the summer working at Kassouf and Co.
Jackie Kamin of Memphis worked at Collat Jewish Family Services, learning about “the amazing work they do as a non-profit organization.” She worked with the CARES program and led two Shabbat services at a retirement facility, among other tasks, and learned about what it means to be a mensch. One of her main tasks was doing in-home surveys of clients in the CJFS Personal Care service. During the program “I have received nothing but kindness and warmth at every turn” in Birmingham, she said. An international studies major, Kaplan, who grew up in Anniston, split his time between Morgan Stanley and being a development intern for the Hillel Connections program at the Birmingham Jewish Foundation. He will continue part-time with Morgan Stanley during the school year. Rebecca Denson of Mobile, who graduated in May with a degree in biology, did the Connections program after returning from Birthright. She had an internship at the University of Alabama at Birmingham, doing cystic fibrosis research at the UAB Department of Pulmonary and Critical Care Medicine. She will be staying this year, taking a gap year and continuing her research at UAB. Hannah Wickham, a medical anthropology major from Edwardsville, Ill., said she “was not really expecting much” from Birmingham. “I have truly found Birmingham to be a unique city brimming with opportunity.” She also did research at the UAB Department of Pulmonary and Critical Care Medicine. Benjamin Honan worked in the offices of Drs. Koslin and Kahn in Hoover, Alabaster and Jasper, gaining “immensely valuable work experience,” as the only jobs he has held before were Sunday School teacher, camp counselor and tutor. Travelute said the interns all gave the program the highest marks in being valuable for their professional development, and for being welcomed by the Jewish community. “The students were asked whether the Hillel Connections experience gave them a favorable impression of Birmingham and the Jewish community as a place they’d like to live,” Travelute said, and all gave the question a “5” on a 1-to-5 scale. Travelute said they are already looking for potential employers for next summer. “Students plan for next summer over winter break, so an updated employer list must be added to the website as soon as possible,” she said. In the future, the program may expand to other parts of the state. Potential employers can register here. Registering does not commit to a position or guarantee a summer intern placement, but “registering as a potential employer will entice student response, attracting the best and brightest to the Magic City,” she said. Travelute added, “this personal relationship will help the students feel connected with our Birmingham Jewish community and could evolve into helping them find mentoring, internship and/or long-term employment opportunities.” Families can register here. Kaplan said the students noticed how involved members of the Jewish community are. “Everybody seems to be doing something,” he said, adding that it shows how many opportunities there are to be an active member of the community. As the program evolves, Weintraub said “We have built a foundation” as the first participants.